Perfect Canvas Airbrush Color Correctors are a long-wear, high-performance airbrush corrector that instantly provides weightless color correction to any skin discoloration or hyper pigmentation concerns while providing ultimate coverage for an even, bright, and more perfected complexion. 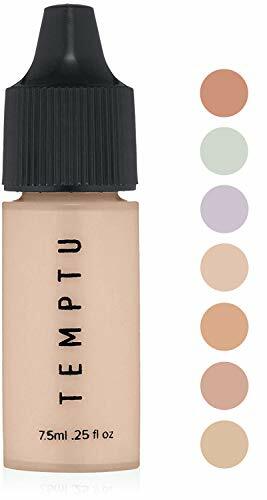 They can be used alone, under or on-top of concealers and foundations and feature a perfectly pigmented formula that allows for buildable coverage to spot correct imperfections or for all over correction. These formulas are designed to meet the main skin discoloration concerns: redness, discoloration, dullness, hyper pigmentation and dark circles. 0.25 oz. bottles / Available in the following shades: Lavender: Brightens while canceling dullness and sallowness in fair-to-tan complexions. Ideal for olive skin tones Light Peach: Neutralizes overall hyper pigmentation, fatigue, age spots, and conceals dark under eye circles and blue veins on fair-to-light skin tones Peach: Neutralizes overall darkness, hyper pigmentation, age spots, and conceals dark under eye circles in tan-to-dark skin tones Green: Conceals intense redness from rosacea, acne, blotchy skin, or irritation on fair-to-tan skin tones Yellow: The most universal color corrector for neutralizing mild redness, dullness, and signs of fatigue in fair-to-tan skin tones Caramel: Perfect for dark-to-deep skin tones to aide in any skin discoloration, hyper pigmentation, under eye circles and uneven skin tone Salmon: The most universal shade for any dark spots and under eye circles on fair-to-dark skin tones Melon: The most universal color corrector to neutralize dark spots, under eye circles, blue veins and hyper pigmentation for light-to-dark skin tones PRO TIP: Use a sheer amount of Lavender on fair-olive skin tone for an ethereal brightening effect. For a natural highlight around the eyes, apply Light Peach corrector under the brow bone.